(by Richard Simon, ChicagoTribune.com) WASHINGTON — A House-approved defense bill deals with Pentagon spending, weapons systems — and taps, the bugle call sounded at funerals. The little-noticed provision calls for designating taps the National Song of Remembrance and establishes recommended conduct during its sounding. The measure comes on this year’s 150th anniversary of the bugle call’s composition, marked recently by 200 buglers playing it at Arlington National Cemetery. The anniversary also will be marked by ceremonies this month at Berkeley Plantation in Virginia, where Union Army Gen. Daniel Butterfield and bugler Oliver Willcox Norton composed taps in 1862. Supporters of the provision note that the nation has a national floral emblem (the rose), national tree (the oak) and national march (John Philip Sousa’s “The Stars and Stripes Forever”). And legislation has been introduced to designate the bison the national mammal. 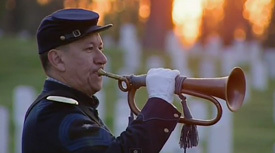 “We’re trying to get a national song of remembrance,’’ said Jari Villanueva, a retired Arlington Cemetery military bugler who heads Taps 150, an organization set up to commemorate the 150th anniversary. 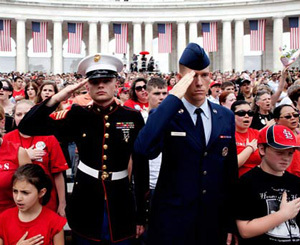 The provision, which expresses the sense of Congress that taps be designated as the national song of remembrance, was sought by Rep. Tom Reed (R-N.Y.) after a retired military bugler from his district approached him with the idea. Villanueva, a member of Buglers Hall of Fame from Baltimore, said that while the federal code defines conduct during playing of the National Anthem, it is silent on conduct during sounding of taps. The legislation provides for an exception when taps is sounded as the final bugle call of the day at a military base. Prospects for the defense bill are uncertain. But when it comes to taps, Congress has, uh, taken note. Reprinted here for educational purposes only. May not be reproduced on other websites without permission from ChicagoTribune.com. 1. On what bill has U.S. NY Republican Rep. Tom Reed placed a provision which would designate Taps as the National Song of Remembrance? 2. When and where was Taps written? 4. For what purposes is Taps played today? 5. Describe the recommended conduct during the sounding of taps that is included in the provision to make it the National Song of Remembrance. 6. Do you think Taps should be our National Song of Remembrance? Explain your answer. NOTE: This is the final article for the school year. StudentNewsDaily postings will resume at the end of August. Have a great summer!